Both payment delays and insolvencies could increase in 2019, especially if price and margin pressures rise and activity in the construction sector slows. 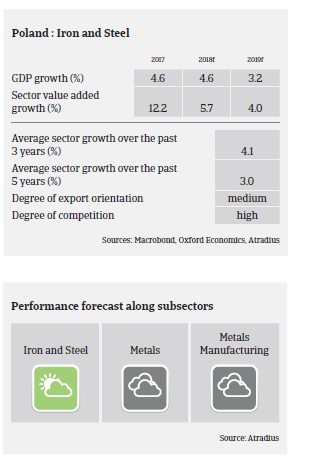 Domestic steel production is dominated by large global players like ArcelorMittal. Along the value chain between mills and final consumers of steel there are a lot of specialised manufacturers and distributors. The direct impact of US import tariffs is low given the limited share of exports to the US (5% of total Polish steel exports). However, pressure on prices and margins has increased due to higher steel imports into the EU in H1 of 2018. Profit margins of Polish steel and metal businesses are additionally impacted by fierce competition in the domestic market, especially in the steel and metals distribution segment. The costs of complying with high EU environmental standards put Polish producers at a disadvantage to non-EU producers. Another issue is the rising cost of electricity. While profit margins have improved over the last 12 months they are expected to level off or even decrease in 2019. Access to bank financing has further improved over the last 12 months, and banks are generally willing to provide loans to the industry. Payment experience has been good over the past two years, and steel and metals business insolvencies have been stable so far in 2018. However, it cannot be ruled out that both payment delays and insolvencies will increase in 2019, especially if price and margin pressures rise and/or should a slowdown in the construction industry, as the largest consumer of steel, materialises. Our current underwriting approach is positive to neutral due to the satisfactory performance seen in 2017 and H1 of 2018, a period in which businesses were able to accumulate capital and increase their financial resilience. However, due to new tax regulations regarding the reverse charge mechanism for construction businesses, we are observing increased concerns among steel and metals distributors dependent on the building industry. Last year a (still voluntary) split payment scheme aimed at reducing VAT fraud has raised concerns about deteriorating liquidity due to the freezing of businesses’ funds related to VAT on a dedicated account. Thus far, this has had less impact on businesses liquidity than previously anticipated. While the market is still growing, increasing costs for construction materials and transport weigh on the performance of construction businesses.